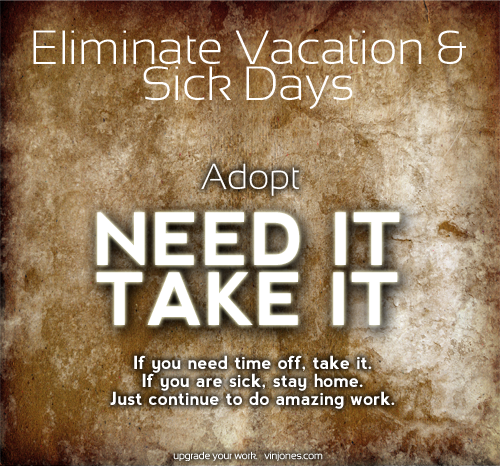 No joke: I firmly believe many employers should not give their employees vacation time. They should completely pull it out of their HR benefits packet. While they are at it, they should also take out sick days as well. Why? – It will be two less pieces of information the employer and employee have to keep track of (which could save the company a ton of money). – They won’t have to play the ‘bad guy’ and enforce it. – Employees won’t stress about whether or not they can take a day off anymore. – It will be a draw for prospective employees. – Your employees will trust you more and they will be more productive. What?! A draw for prospective employees? Employees will trust you more?! If you need time off, take it. If you are sick, stay home. Just continue to do amazing work. Intel approaches this. The group that I was in when I worked for them told us to take about three weeks of vacation, but there wasn’t an official way to keep track. If we were sick, we should stay home. If we needed to leave early, we just did it. What matters is if we were getting our work done. The next step is to completely get rid of the word VACATION. But, when bringing this up I invariably get the objection: Employees will abuse it! Of course that is an objection. Probably because they don’t trust their employees and they made some bad hiring decisions. But if you hired people you trust, there is no need to keep track of vacation or sick days or (unless they are in a production environment) when they come to work or go home. As long as they are producing the desired results they should be given the flexibility. In theory, I don’t think many people will disagree with me. But when it comes to actually doing it, there are very few who will take that step. But Evernote did. And it has worked really well for them. Think about it. Less accounting. More trust. Even more work accomplished? So, what’s stopping you?